Signs by Crannie will participate in National Manufacturing Day, which draws high school, community college and technical students to learn more about the many careers in manufacturing. The event is co-sponsored by the International Sign Association, the National Association of Manufacturers, the Flint & Genesee Manufacturing Coalition and the Flint and Genesee Chamber of Commerce. On Oct. 2, Signs by Crannie will showcase the sign industry’s wide range of careers, from artists to electricians, from sales professionals to installers. In all, more than 200,000 professionals work in the industry. Over the course of the next several years, SBC will need electricians, welders and metal fabricators, commercial vehicle operators, and graphics designers. According to data provided by the Workforce Intelligence Network, each of these jobs are experiencing double-digit growth, and pay between $14.61 and $29.57 per hour. 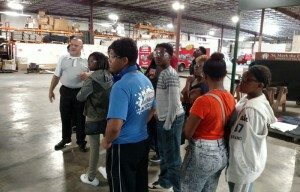 To join in National Manufacturing Day, students or educators should contact Amy Watts at (810) 600-1413 for tour times. All others should contact Alicia Posh at 810-487-0000. Deadline for contact is Sept 29th. Refreshments will be provided. Any required safety gear such as safety glasses will be provided. No open toed shoes. Specializing in custom fabricated signs for commercial and business use, Signs by Crannie maintains offices and manufacturing facilities in Flint, MI, and Ft. Myers, FL. The company has been providing a broad range of signage throughout the U.S. and Canada for more than three decades. Its product line includes LED, digital, highrise, pylon, monument and archway, along with vehicle wraps, scoreboards and other custom offerings. Signs by Crannie is also a member of the International Sign Association (ISA). The ISA represents manufacturers, suppliers, and users of on-premise signs and sign products from the United States and 60 countries around the world. ISA and its Affiliated Associations work to support, promote, and improve the worldwide sign and visual communications industry. ISA and its Affiliated Associations work to support, promote, and improve the worldwide sign and visual communications industry, which employs more than 200,000 American workers and has an economic impact of $37.5 billion. Signs by Crannie is a charter member of the Flint & Genesee Manufacturing Coalition. The purpose of the new Coalition is to secure resources for jobs-driven training programs, and strengthen growth opportunities for local companies. The focus is on getting more individuals education aligned with high-demand, good-paying manufacturing jobs including CNC operators, CNC programmers, welder and others. To support these goals, the coalition is hosting plant visits, speakers at forums, and supporting the creation of additional training programs to generate awareness including National Manufacturing Day.